Plumbing emergencies happen, and when they do, they can be an extreme hassle on anyone’s daily routine. However, it’s important to understand when the phone call to a plumber can wait. Here’s a quick guide to help you determine when you should call a plumber right away or when you should hold off and call during regular business hours. Will leaving the problem alone cause more damage? If yes, call a plumber. Do you have an alternative temporary solution? If no or you’re unsure, call a plumber. Can you shut off the main water valve to put the issue on hold until regular business hours? If not, can the water damage be mitigated until regular business hours? If you’re unsure of where the water valve is or don’t feel comfortable messing with it, call a plumber. If you can’t afford to temporarily shut your water off, call a plumber. If you’re unsure about the severity of the water damage, call a plumber. Is the affected plumbing an important part of your daily routine? Sometimes certain plumbing aspects are necessary in order to get your day going. Call a plumber if this is the case. 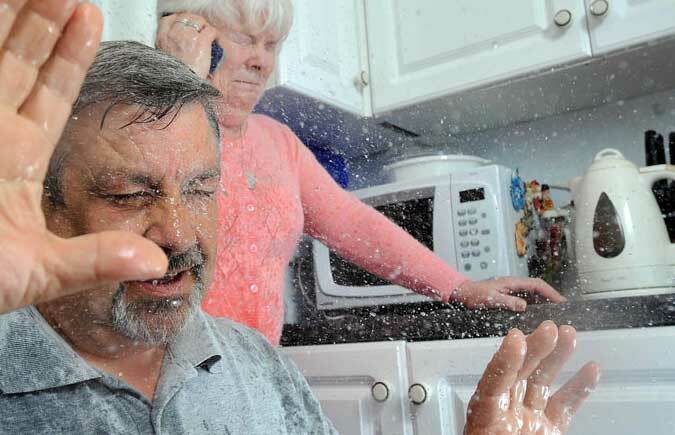 Pipes that burst can do a lot damage. Turn the main water valve off immediately and call a professional. This plumbing emergency can bring flood waters knee deep if left unattended. No one is pleased when a toilet is clogged. For an unmanageable overflowing toilet, call fast. If a toilet is clogged and you only have one bathroom—pick up the phone. If you have a main drain that is clogged and things are backing up, go ahead and call the emergency line. While it may be painful to watch a plumber using an auger at midnight, you’ll be thankful they did. Sometimes debris or tree roots can build up over time or start to damage pipes. If you notice a smell similar to rotten eggs near the hot water tank, call a plumber immediately. Natural gas is a serious problem when a leak occurs. Do not use any hot water. If you know where the main natural gas line is, turn it off. Do not smoke, cook or use anything that requires an open flame. Are you dealing with a plumbing emergency? North County Plumbing is located in Oceanside, California and has been in the service business since 1970 providing quality plumbing services throughout surrounding cities. Our qualified technicians are available and ready to respond to your emergency with fully equipped service trucks. Contact us today!